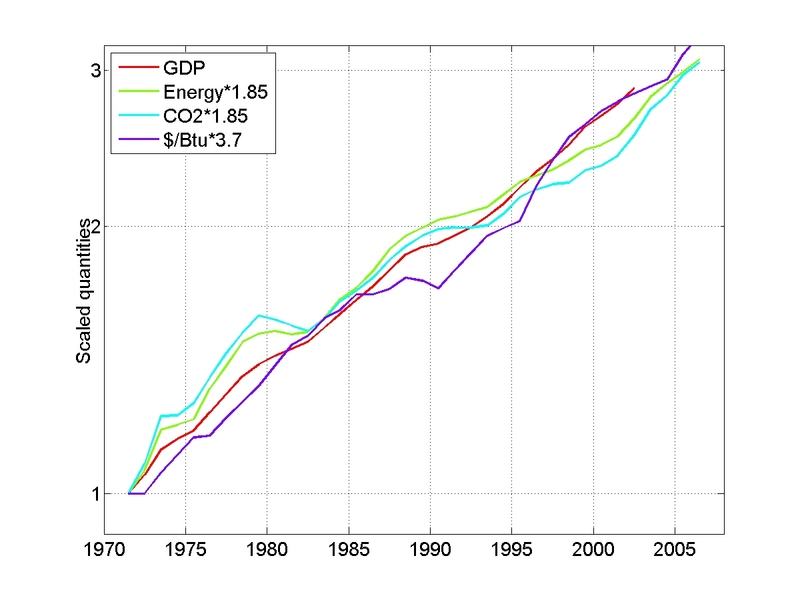 Dollars of income generated per unit of energy expanded globally per year ($/Btu). 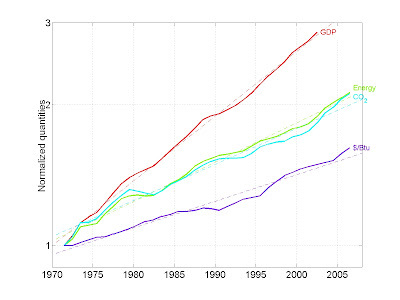 All values are relative to those in 1971, and all curves start from 1. All trends are exponential, so they plot as approximately straight lines on the semi-logarithmic scale. 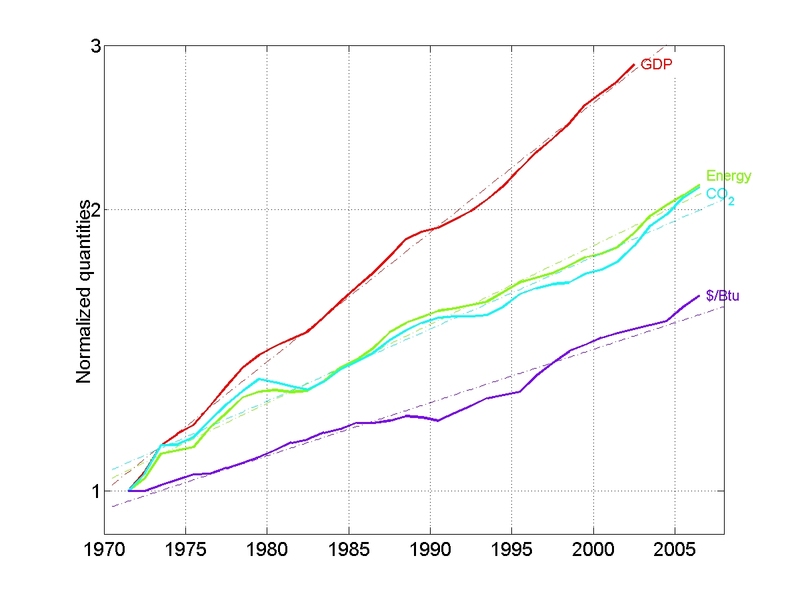 The global GDP grows roughly 1.85 times faster than global energy use and global CO2 emissions, and 3.7 times faster than global efficiency. The rate of energy use and carbon dioxide emissions are virtually identical and have grown exponentially over the last 40 years. The impact of large dams and nuclear power plants has been barely visible, and disappeared by 2007. The renewable energy sources, wind turbines, biomass cogeneration, and biofuels (photovoltaic panel area is too small to be relevant), are barely keeping up with the deforestation and general paving of the world. Increased efficiency leads to more energy use and the ratio of the slopes has remained constant (3.7) over the last 40 years. Thus, just as Stanley Javons predicted, higher efficiency leads to more energy use which leads to still higher efficiency. Since the Earth is finite, this trend cannot continue and the current global economy must break down. There is nothing we can do about it, unless we fundamentally change, and the approach to breakdown is exponential. I spoke more on this subject here. 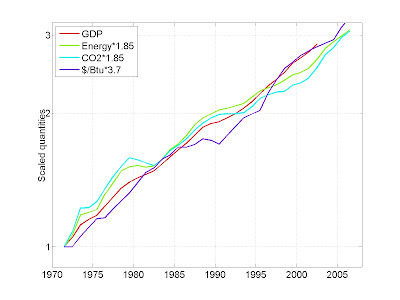 For example, the expected period of doubling of global energy consumption is 34-37 years. Since this doubling is impossible, claims to the contrary by the IPCC notwithstanding, the global economy as we know it today will cease to exist within the next 10-20 years. Something's gotta give! It is quite possible that earthlings can learn and act when faced with an old problem with no old solutions. Tad, Thanks for your treatment of it. I posted couple paragraphs on Anatole France's blog quoting from your post, which should appear soon. Basically I agree largely with your view except for the "standard caveat" that "unless something changes the system" is missing. The hard and fast rule for growth systems is that something internal or external will indeed change them, and they don't all crash. It is indeed incredibly serious that after 40 years the efforts of the green movement show no effect in changing the system whatever. If one is not found the way the system would crash is something probably something like what you say. George Mobus writing on his "Question Everything" site has a similar high level systems theory approach, that also convincingly shows the dramatic consequences of the present course of events. He also errs in not considering how the system might be changed if it's main internal steering mechanism were altered, though. My recent discussions of that are on my blog: "Reading Natures Signals" [www.synapse9.com/blog]. I probably use unfamiliar terms of discussion for many, but try to explain things in as close to standard English as possible. Basically there is a very strong self-interest for the financial system in not destroying the economic system and the environment, very strong. There is also a huge effort taking place throughout the halls of finance around the world to discover how. They are fixated on old assumptions, though, so the fairly obvious solution, actually first proposed by JM Keynes, looks completely contradictory to them or else leaves them so breathless they go look for something else... It'll be “interesting” to see if they break down and cry, or break down and think!! It's going to be one or the other it seems. Military Appeal to American/World Citizens to ‘Walk their Talk’ of ‘Supporting the Troops’, by massively reducing their energy consumption, by – for example - “planting victory gardens, cutting down on fuel use, saving scrap metal and old rubber, sacrifices, or maybe just examples of common sense and prudent lifestyle changes”; have been ignored. [5.2] Corporate Media’s Pro-Growth Agenda is the cause of Citizens Eco-Illiterate ignorance of how to contribute to Sustainable Security: Procreate and Consume below carrying capacity, to avoid scarcity induced resource war conflict; and elect Eco-Literate politicians to enact sustainable laws. [5.3] Tragedy of the Dunning-Kruger Democracy Commons: Eco-Illiterate Taker Cheater (conditional co-operators and free rider) citizens elect Eco-Illiterate Taker Cheater (conditional co-operators and free rider) Politicians. [5.4] Nash Equilibrium Game Theory: International Cooperation requires politicians who are issue specific unconditional co-operators - Leavers. Milgram: Obedience Study: 92% of citizens are conditional co-operators and free riders (65%); which only leaves 8% who are capable of issue specific unconditional co-operation. Consequently, universal franchise One Man, One Vote means that conditional co-operators and free rider Taker citizens elect conditional co-operators and free rider Taker politicians. Electing Eco-Literate Unconditional Co-operators politicians requires only licensing Ecoliterate ‘unconditional co-operators’ with a license to vote. [6.1] Implement Coup d’état De-Industrialization and Sustainable Security Constitutions: we mitigate ecological collapse, and our children have a survivable sustainable security opportunity to manage the path towards a de-industrialized low/no tech, agrarian future. [6.2] Do nothing and allow Politicians to Implement Green Economy Industrial Revolution: we keep industrial civilization heat engine lights on for a bit longer, which fails to reduce carbon emissions; activating runaway global climate change and near term extinction. We send our children into a climate furnace involving ecological collapse and extinction for humanity and millions of species.